It's Tuesday and I'm nursing a brand new foot injury. Crutches and plenty of Advil, I'm going to be limping for the next couple of weeks. I thought I'd share with you my weekend adventures, which led to my foot injury. It was an afternoon with the Asian American YouTube celebrities. They were part of a special panel discussing about the future of YouTube and hundreds of people were lined up in the rush line to see if they can score a ticket, but the event was sold out and seating in the theater was small. But still, it was really fun. The swarm was totally nuts after the event, with people outside the theater getting their photographs with all the celebs. For more about the event, visit Wong Fu Production's blog. 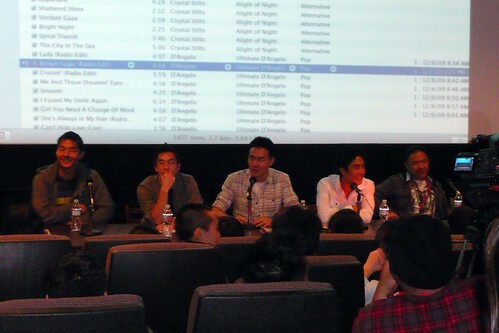 From left to right: Kevin Wu, Wong Fu Productions, Ryan Higa, and Timothy De La Ghetto. It was a day at the Cow Palace (no, not the gun show) for some professional wrestling. 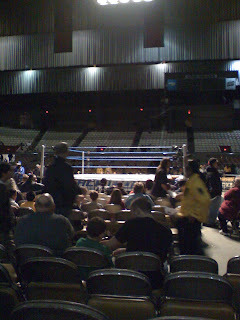 WWE was in town for a non-televised show and getting into the facility sucked. There was only one entrance to get inside and the line was literally the length of two football fields while everyone is being screened by less than a dozen security guards.. The program wasn't even sold out with plenty of seats available, but many paid the minimum $40 charge to get seats like the ones I got below, which was so close to the action. Oh yeah, tons of people drinking and throwing crap onto the ring. Kevin Wu!??! That's KevJumba's real name? Hahahah I think i'll stick to calling him KevJumba. Hope you heal soon!